St. Martin's Press, 9781250121233, 304pp. London, 1922. It’s a cold November morning, the station is windswept and rural, the sky is threatening snow, and the train is late. Vivien Ripple, 20 years old and an ungainly five foot eleven, waits on the platform at Dilberne Halt. She is wealthy and well-bred—only daughter to the founder of Ripple & Co, the nation’s top publisher—but plain, painfully awkward, and, perhaps worst of all, intelligent. Nicknamed “the giantess,” Vivvie is, in the estimation of most, already a spinster. But she has a plan. That very morning, Vivvie will ride to the city with the express purpose of changing her life forever. 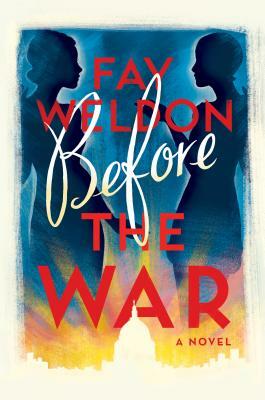 Inventive, warm, playful, and full of Weldon’s trademark ironic edge, Before the War is a spellbinding novel from one of the greatest writers of our time. "Featuring a cast of oddball characters and astute observations about courtship, family, and what it means to be human, Weldon’s novel crackles with erudite writing evocative of the time period. This is a complex character study filled with wit and wisdom about family, society, and the restrictions both can place on women." “Interjections of authorial opinion and wit entertain." "A romp of a read full of Weldon wit and wisdom, as well as sumptuous period detail, gawky, oversized Vivvie is a wonderfully offbeat heroine while her mother Adela makes a brilliantly ghastly villain." "A daredevil combination of farce and satire, pathos and bathos, written in a post-modernist, self-referential style, which effervesces its eccentric way through 300 mesmerizing pages that carry shades of Oscar Wilde, Evelyn Waugh, P. G. Wodehouse and John Fowles.